If there’s one thing you can be sure of it’s that at Biologi, we LOVE product ingredients! We love to share what ingredients are, what they do, and, more often than we’d like, why ingredients don’t always do what they claim. The Biologi way is to offer transparency around our ingredients and processes because we believe that every consumer has the right to know what they’re putting on their skin. Our goal is to arm consumers with as much information as possible, so you can all make informed decisions about the products you choose, and how to use them. There’s a lot of misinformation out there about what ingredients do and don’t do, so here’s our comprehensive guide of the ingredients currently used in Biologi products. As a company, we’re completely ethical, sustainable and traceable so we also want to tell you how our ingredients are sourced and manufactured. Because for us, transparency is key. Kakadu Plum is the only ingredient in our Bk Rejuvenating Eye Serum. Why do we use Kakadu Plum? When you think of vitamin C, your mind generally pictures a big juicy orange, but the lesser known Kakadu Plum contains the highest recorded levels of vitamin C of any fruit in the world. Containing up to 75 times more vitamin C than the humble citrus fruit, Kakadu Plum is much more potent and beneficial to your body, both inside and out. Kakadu Plum is rich in phytochemicals which have anti-carcinogenic, anti-fungal, anti-viral and anti-inflammatory properties. Kakadu Plum also contains ellagic acid which is an anti-oxidant with cancer-fighting properties that works against a wide range of carcinogens in many human tissues. These powerful antioxidants also flush out toxins helping to clear pimple-causing bacteria from the face. The fruit is a traditional source of bush tucker and has been used as an antiseptic remedy for the Indigenous people across the Arnhem Land for thousands of years proving it’s nutritional and healing properties. The Biologi way: Sustainable and organic Kakadu Plum. Sourced from the Northern Territory, our wholesaler arrangements are with legitimate companies whose product is harvested by those living in the Aboriginal communities. It’s common to have many links in a supply chain but we source our product directly from the wholesaler cutting out all the middlemen who would normally make a profit during this process. Kakadu Plum must build up robust nutrient levels to survive out of its naturally arid environment so our direct arrangement means that all the Kakadu plants used in our products are extremely potent providing the best benefit for your skin. 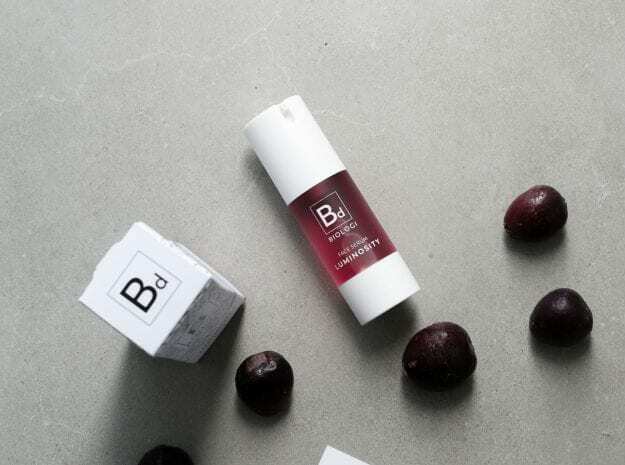 Davidson Plum is the extract used in Bd – Luminosity Face Serum. Why do we use Davidson Plum? Davidson Plum contains high levels of anthocyanins which are natural pigments that have strong cancer-fighting antioxidants. The antioxidant capacity of the Davidson Plum is higher than the blueberry, which is renowned worldwide as the ‘health-promoting fruit’. Davidson Plum’s flavone glycosides are strong antioxidants that stabilise and intensify the antioxidant activity of vitamin C making natural vitamin C more effective without the use of synthetic stabilisers (which make vitamin C as good as useless as an anti-oxidant might we add). Now, while that all makes sense to us, if that information has left you a little baffled, here’s what it means to those of you concerned about your skincare results. Davidson Plum behaves like an AHA (alpha-hydroxy acid) which means it evens out skin tone helps to fade dark patches, promotes cell turnover, hydrates cells and provides an overall healthy-looking complexion. Not only that, regular topical application of Davidson Plum extract also promotes collagen growth (the protein that slows down as you age leading to sagging and wrinkles), and reduces the signs of UV damage contributing to an overall younger look of your skin. As if Davidson Plum wasn’t as good as it gets in skincare, it also assists in the treatment of acne by balancing the skin’s natural oil production and gently cleansing away excess sebum. The Biologi way: Sustainable and organic Davidson Plum. Davidson Plum is a native rainforest fruit of sub-tropical-coastal New South Wales and North-East Queensland. We primarily source our Davidson Plum directly from a grower in the Byron Bay hinterland making it organic while contributing to the sustainability of local agriculture. The superiority of this product means it doesn’t lose its nutrients when it’s frozen, so our supplier also sources the fruit frozen from Queensland. Like all native Australian fruit, Davidson Plum is full of potent phyto actives which gives the fruit a tangy taste. The sourer the fruit, the higher the level of phyto actives present. And yes, reading between the lines, as our Bd serum is 100% plant serum, that does mean you can drink it too! Finger Lime is the ingredient (yes, singular, there’s only one!) in our Bf Hydration Body Serum. Why do we use Finger Lime? The bioactive compounds of this fruit help to facilitate absorption of vital ingredients into the skin, improve skin hydration and support collagen production. Comparably, Finger Lime contains three times the vitamin C found in a mandarin and has a higher anti-oxidant content than both dried and fresh goji berries. Finger Lime seeds help to heal acne, premature skin aging caused by too much sun, ichthyosis, psoriasis, rosacea, and has the ability to help with uneven skin pigmentation. Lastly, but by no means least, Finger Lime interrupts keratinization (the barrier that holds dead skin cells together with a glue-like substance) to reduce oil build-up, acne, wrinkles, and uneven skin tone. It’s this process that can leave you with a slightly sticky residue when you first start using the product on your skin (don’t worry, this doesn’t last long). The Finger Lime is widespread in the Northern Rivers of New South Wales where Biologi products are manufactured and a strong relationship with a Finger Lime farmer provides the perfect opportunity for us to use locally-sourced fruits and quite literally put them directly into your bottle. Biologi is committed to using natural organic ingredients that are ethically sourced and manufactured while creating a product that gets you results. And, as our product range grows, we always will be.